Escape to this cozy and newly renovated cabin nestled in the trees! Mountain themed decor and furnishings plus the wood floors throughout add to the Tahoe charm. Enjoy modern conveniences such as a flat screen TV in the living room and high speed internet. Soak in the sun, BBQ or enjoy the fresh mountain air on the large front deck. 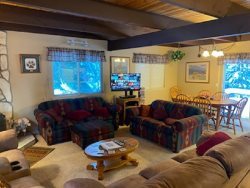 Located in a peaceful and quiet neighborhood about 15 minutes away from the casinos/ downtown area. *While we hope you and your group will have a memorable vacation, we cannot stress enough how important it is to abide by the City of South Lake Tahoe’s laws. Laws are now being enforced more strictly than before where citations will be issued to guests directly and also to owners with no warning. Citations are no less than $1,000. Please abide all laws especially those in regards to noise, occupancy, and parking.